From the poem "No way. The hundred is there." by Loris Malaguzzi, founder, philosopher and guide of the Reggio Emilia approach. The Early Learning Center (ELC) is home to our youngest learners, children from ages 3 to 5. It is a children’s center where joy, play, wonder, curiosity, inquiry and creativity are the ways in which children learn. We recognize and respect the potential of each child to communicate their understandings, thoughts and feelings using many different “languages” as ways of expression. These may include music, dramatic play, sculpture, painting, drawing, singing, dancing, photography, video, words, stories, poems, climbing, running, and many, many more. Through the IB Primary Years Program (PYP) and inspired by the Reggio Emilia Approach, we endeavor to foster children’s learning through the development of all their “languages” and by creating an environment to support this way of thinking and being. Early Learning Center is a mixed-age program comprised of children who have turned three years of age by September 1st in the year of entry and 4-year-old children who have turned four by September 1st in the year of entry. 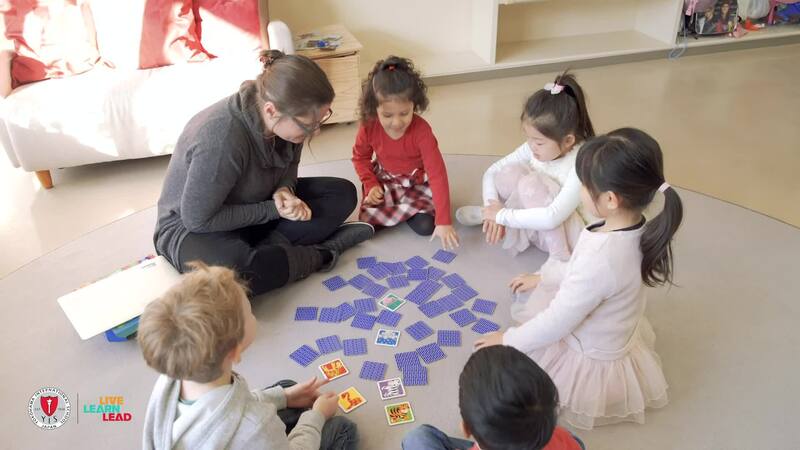 The 3-year-olds enroll initially for a half-day program, which can be extended to a full-day program after the October break with the teacher’s recommendation and on parents' request. The 4-year-old children generally come for the full-day program, depending on parental choice. Prior to entry parents and children are invited to spend some time at the center. Children must be able to use the toilet independently prior to admission. Please see the Admissions section of the website for further details regarding admissions policies and procedures. Children may be dropped off at the ELC from 8:25 am. *Half-day students do not stay for lunch. Snack time is held in the morning. The children bring two or three pieces of fruit from home each week and this is shared with the class each day. Lunch is from 12 noon for those children remaining full-day. Parents have the option of ordering lunch from the school cafeteria, Dragon Dining, or bringing lunch from home. The ELC, adjacent to a lovely park, is housed in a purpose-built building across a few minutes walk from the main YIS campus. There are classrooms, an atelier (art studio), and large communal area called, the Piazza, which includes the dining area, library and plenty of space for creative exploration. Upstairs is the school auditorium. The ELC also has a playground for outdoor activities and terrace areas in the front and back of the building.